A false twist textured yarn is a continuous filament yarn that has been processed to introduce crimps, coils, loops and other fine distortions along the yarn's length. These distortions give synthetic yarns such as nylon, polyester and polypropylene improved properties such as stretch, bulk, improved thermal insulation and an appearance similar to natural fibres. 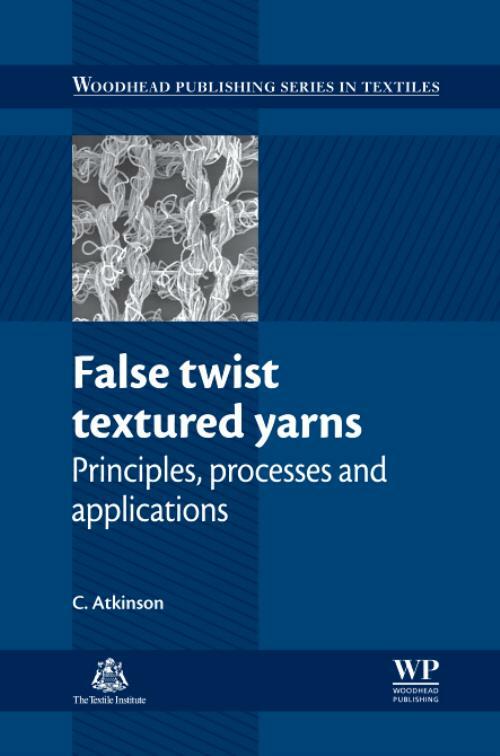 This important book summarises the key principles, technologies and process issues in the manufacture of high-quality false twist textured yarns. After an introductory chapter on the development of textured yarns, the book reviews yarn texturing machine designs and twist application methods, including air jet mingling and machine variants for draw textured speciality yarns. It also reviews common process performance and quality problems and how they can be resolved, as well process control, quality assurance and costs. The final chapters look at applications of false twist textured nylon, polyester and polypropylene yarns as well as the future of false twist texturing. Based on the author's extensive experience in the textile industry, False twist textured yarns is a standard reference on the key technologies and process issues involved in the manufacture of high-quality false twist textured yarns. Atkinson, CDr Colin Atkinson is a leading consultant to the textile industry in issues affecting textured yarns with over 30 years' experience. He is a former Managing Director of Intex Yarns Limited and Technical Director of Rieter-Scragg Limited, one of the world's leading manufacturers of yarn texturing machinery.